Welcome to Root Beers, a sort of comic where anything could happen beyond the imagination, at some point. For the comics, go to the latest comic or the archive of comics. Root Beers was first proposed in December 2008, as a weekly comic on weekly E-News, the news website of Southampton City College. It was quickly ended after E-News went monthly. 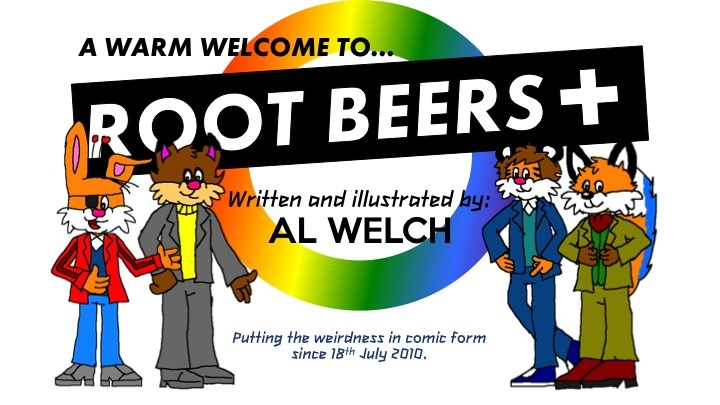 On Sunday 18th July 2010, after a few tests with his Bamboo Graphic Tablet, Alexander Elliott-Welch (known as Al Welch) has started up Root Beers on deviantART. Originally, it was one shot, the Bunnzies emerge from a science-fiction novel that was never actually started production. Nick Bunnzie came before the comic's launch on deviantART, Dennie Bunnzie came on 13th September 2010 on a placeholder, and the Bunnzie sisters, Nancius and Choco-Rheged "Jen" Bunnzie, arrived on 13th November 2010, after the protests on tuition fees. Al never actually went on the protest. While working on his advent calendar, Al Welch was thinking Root Beers may need to expand more. So, on 6th February 2011, the blog was launched. Followed by FurAffinity and this bloody website in Summer 2011. There were more characters to put on the comic strip, including Ally Bobcat (an art student from the University of Oxford (fictional) with talent), Carol Woole (a trendy sort of catgirl who is also Ally Bobcat's girlfriend), Fredrick Foxx (a bloody rich fox with a taste for music), Tim Tiger (an American tiger who think he's cool) and Morti Mouse (a mouse who adores British film and is not seen on this cover image). On Good Friday, 3rd April 2015, the comic reached its 100th issue. On Saturday 18th July 2015, the comic celebrates five years of revival on DeviantART. Since 3rd February 2016, Root Beers has its own midweek edition, on the subject of topical, available on deviantART and Twitter. Since February 2017, Root Beers has its own mini-series (or so) on Tapastic/Tapas, updated every Tuesday (Well, almost). © 2010 - 2019 ATV Bungo Entertainment Unlimited. All Rights Reserved. No service charged.